Discharge drums of 60 PCF Sodium Chlorite powder into an existing inlet hopper. 46½ ” discharge height, 150° rotation. 304-2b stainless steel pour cone with continuous TIG welds, polished smooth. Heavy-duty cone agitator features motor, gear reducer, shaft seals, bearings, and stainless steel agitator. 14″ diameter manual slide gate at pour cone discharge. 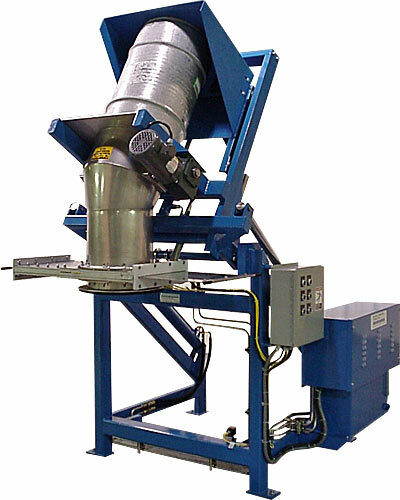 Dust-tight Lift & Seal System™ with hydraulically seals drum to the pour cone. Digital pressure switch on Lift & Seal System™ automatically adjusts for drum height variances for dust-tight sealing. Tubular frame with continuous welds. Flat bottom carbon steel skip for easy floor level drum loading. NEMA 12 control station, 115v/1ph/60Hz. Parker 2 GPM hydraulic system features 10 gallon reservoir, top mounted enclosure, submerged pump, and return line filtration for quiet, dependable operation.